Today I want to share with you all my all-time favorite scrubs! It include, facial scrub, hand/feet scrub and body scrub! Anyway, below are my thoughts on my all-time favorite scrubs! Cure is a natural esfoliating gel that removes dead skin effectively it is fragrance-free, no artificial colors or preservative, it is made from activated hydrogen water! 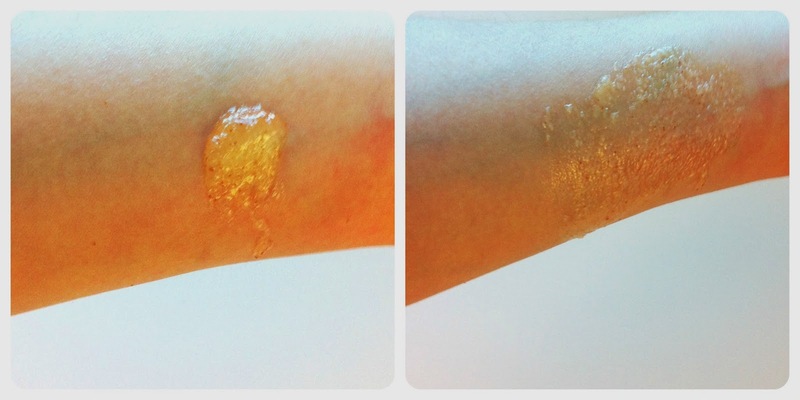 Cure is a water-based exfoliant made from natural plant extracts of aloe vera, gingko and rosemary! 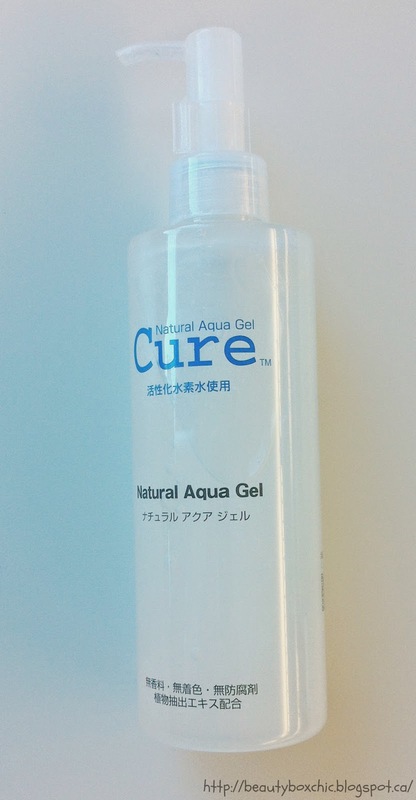 91% of Natural Auqa Gel is made up of water! This product claim to be No. 1 best-selling exfoliator in Japan! This product is made in Japan. 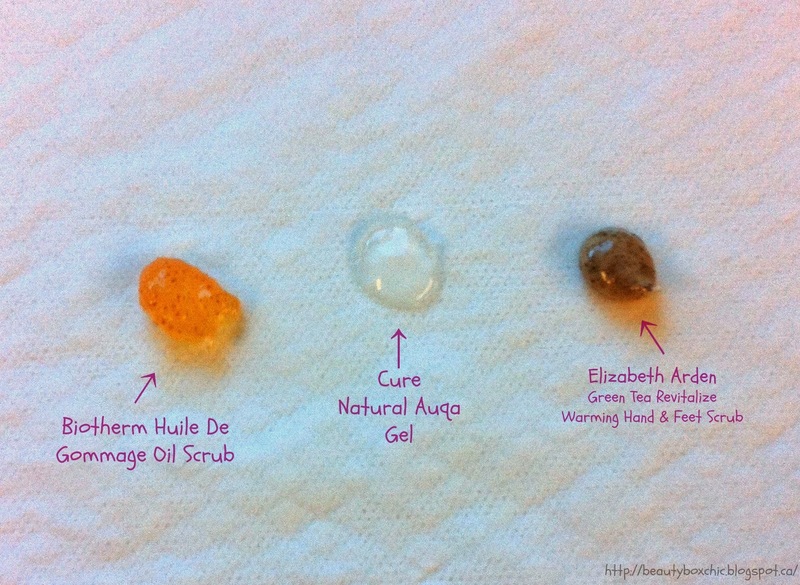 Where to buy (Cure Natural Auqa Gel)? Imomoko , this is an online beauty and skincare website found in Los Angoles, USA. They ship to many countries and do ship to Canada! For more information about Imomoko, please visit them at http://www.imomoko.com/ and go see what they can offer to their beauty customers. I personally love shopping with Imomoko they offer so many different Asian brands! I highly recommend checking them out!! 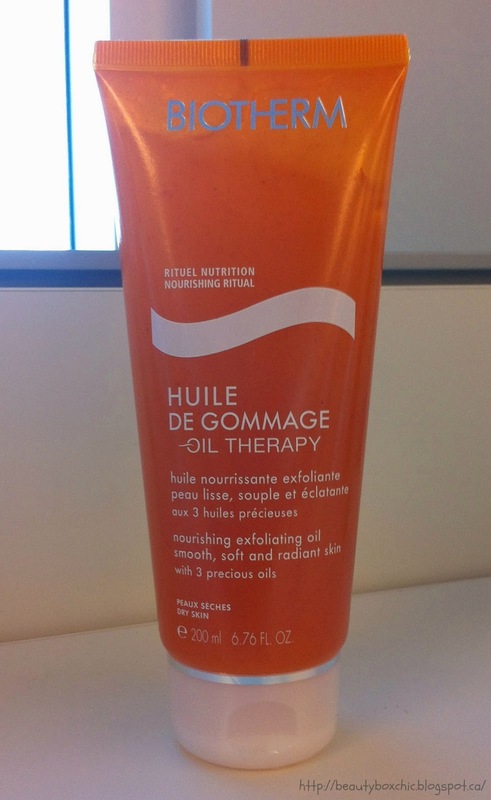 Biotherm Huile De Gommage Oil Scrub is an exfoliating oil with melting sugar crystals that refines and smoothes skin. It is made with apricot oil and ogema 3+6! It helps relief dry skin, regain it softness and smoothness after use. 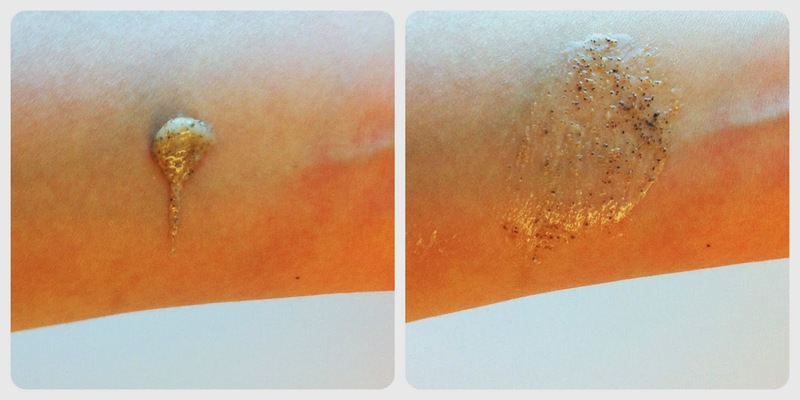 Not only does this body scrubs smell amazing, it leave a silky feeling on the skin after used. This product is made in France. Elizabeth Arden Green Tea Revitalize Warming Hand and Feet Scrub is a warming formula that heats up when contact with water. Made with Green and White tea, gingko biloba and sophora japonica extracts. These ingredients helps protect the hand and Feet while cleaning and softening the skin. It also relief dry skin, leaving a silky feeling after use. This product is made in USA. 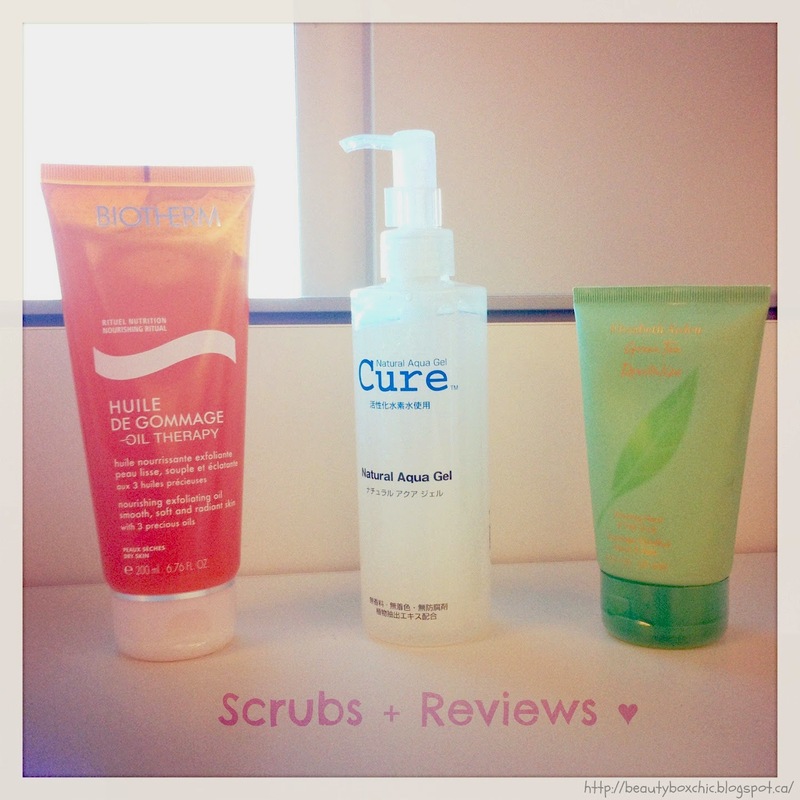 Overall, I really like these scrubs and do recommend it for others to try. My skin type is prone sensitive, all the below scrubs work well on my skin as I have no irritation or burning sensation after each use. Hope this review give you all a better idea of my favorite scrubs. I will resume blogging after my Final exams, wish me luck :) Talk soon. By the way, what is your favorite face, body or hand and feet scrub? I'm using H2O+'s dual action exfoliating cleanser, but it doesn't moisturize so I'm going to keep an eye out for the Cure brand at Winners now! Thank you :) Awww icic, sorry to confuse you, we can only buy Cure online, I brought Cure Natrual Aqua Gel through Imomoko website link: http://www.imomoko.com/ Imomoko, do ship to Canada. The only items I found at Winners is Elizabeth Arden products. Sorry to confuse you. 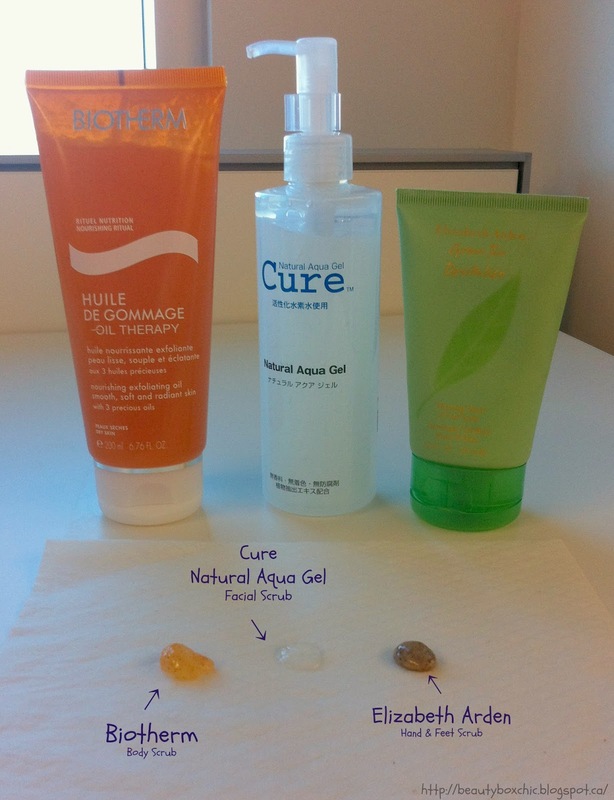 I want to try the biotherm one!! 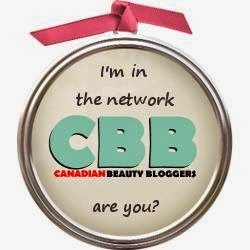 Very yummy lol, thank you :) I just follow you back on Bloglovin, thank you for connecting with each other, it is nice to connect with other beauty bloggers. I will for sure check out ur post on LOTD, thank you for sharing with us! ohhh great review!! thanks for sharing with us your favorite scrubs.. i really want to try that cure one.. i'm trying to move towards more natural products!! and i love anything that has aloe vera in it.. helps calm my skin i get red patches so easily boo! I've tried the Cure since we have it here and it's pricey as well. I'm interested with the EA Scrub in Green Tea. I have the perfume and I like it ^_^ Good luck in your exams Janet! I've never considered body scrubs. I'm interested in trying the Biotherm one. My skin needs some scrubbing! Thank you for the review and images! I dont really use body scrub , maybe i should start soon. But i still sticking to st ives facial scrub cause its affordable and makes my skin feel good. Thanks for all the reviews! Im interested to try the cure and elizabeth arden ones! I heard good things about St.Lives scrub too, my best friend actually use it too :) Thank you for stopping by my blog, thank you Yoannita, you are so sweet, i really recommend trying them, they are amazing scrubs!!!! You've just reminded me of how much I really need to take care of my skin! Thanks for your review on the items! Sounds amazing. Loved your detailed reviews sweets <3 Thank you so much for the reviews. Happy weekend !! Thank you Belle :) Anytime, you too, have a good upcoming weekend!!! Great! I never know what to get and spend ages choosing. Biotherm is a great brand. Looking forward to trying it. The hand and feet scrub look great. I am always looking for something new. I love a great exfoliant. Great review. Great review! I loved how you even showed the product on your skin and offered pros and cons so easy to see. I'll have to try the Cure one. My skin is sensitive, but it sounds like this one will work well. 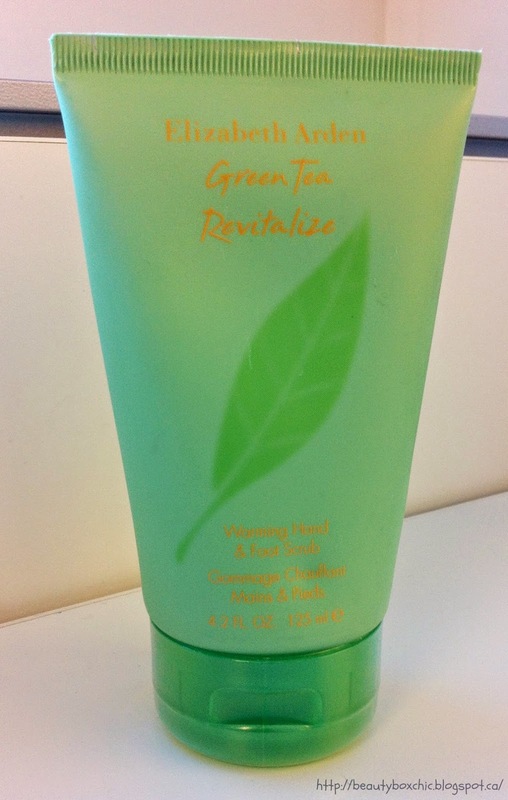 I had no idea the green tea product had a scrub! I love the perfume! Great post, must have taken you forever with the formatting!! Sometimes when I use a scrub, there will a time that it seems it stops working. When that happens, I usually change my routine and just go back to scrubs after a period of time.